Just in time for the grilling season, Stubb's Bar-B-Q names Austin-based Proof as its first-ever AOR to oversee all creative duties, including print, digital, social and promotional events. Proof will also handle all media buying and planning for the brand moving forward. There was not a formal review process. This represents a new direction for the brand known for its sauces and marinades. Previously, Stubb's has worked with agencies on a project-by-project basis, most recently being Austin-based McGarrah Jessee for a packaging assignment. Media was also previously handled by Austin-based Mediacentric. Now, Stubb's is consolidating its accounts with Proof in order to achieve brand message consistency and national growth. This spring, Proof and Stubb's are launching a national initiative to coincide with the grilling season featuring Stubb's Original Bar-B-Q sauce. At the same time, the two companies will launch a product campaign for Stubb's new Anytime Sauces collection. Both campaigns are designed to reach longtime core fans, as well as reach new consumers and plan to emphasize the brand's history as a true 'craft' brand. Indeed, the brand's namesake is a true character that should resonate as an authentic backstory. C.B. Stubblefield (known as "Stubb") is known as a west Texas hero, having run one of the most famous BBQ & Blues houses for years where famous blues artists would come 'sing for their supper'. The brand continues to use his smiling face on its packaging. 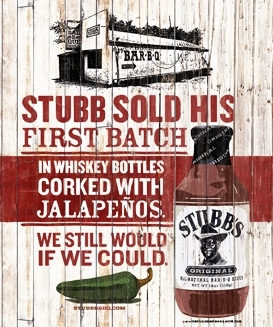 Proof first starting working the Texas-based brand last fall on a digital campaign supporting Stubb's new line of Cookin’ Sauces.